In our dining rooms and diners, we stir together a handful of humble ingredients to produce an amber elixir that tastes like the South and feels like home. “OK, this is how we make the sweet tea,” Anita Hall says. Anita has waited tables for at least 25 years here at Pressley Park, a meat-and-three a few miles south of uptown Charlotte. She shows up at 3:45 a.m. to brew tea for the cops and construction workers who want breakfast before dawn, and the families who take home jugs for the weekend, and the guy from Baltimore who picks up two gallons every time he goes home so he has something to drink with his crab cakes. This tea is the color of a baseball glove, but clear enough to see through. And in one cold glass you taste the South — the sweetness of a hunk of cane sugar, the tannins of a black-water creek. The joke at Pressley Park is that Anita doesn’t drink the tea — she likes coffee better. But every morning she starts making tea, and by closing time at 3 p.m., they’ll have gone through 35 to 40 gallons. One belongs to George Gregory, who runs Pressley Park. The others belong to his dad and mom, Andy and Tina, who opened the restaurant and still help out. It turns out there’s a secret something in the sweet tea. They’ll laugh when you try to figure it out, but they aren’t about to give the secret up. The truth is that there’s a secret something in every glass of good sweet tea. You can doll it up if you have a mind to, but all you really need are tea bags and sugar and water. Somehow, though, when you put them together, it’s magic. People divide the South from the North at the Mason-Dixon Line, but I’ve always thought the real marker is the sweet-tea line — the point where, at the next diner north, they don’t have sweet tea ready to pour. I’m not sure just where the line is. I feel sorry for those poor souls up above it. But one thing’s for sure: North Carolina is on the good side. And over the years, in this part of the world, sweet tea has become infused with meaning. It’s more than just a drink. Sweet tea is our alchemy — our gift of making something special from humble ingredients. (Just like barbecue, conjured into glory from the cheapest cuts of meat.) Sweet tea is our love offering, poured for family and neighbors and even the guy trying to sell us new gutters. And at its most basic, sweet tea is a cold blast on a hot day, like a dip in a river from the inside out. We have been drinking sweet tea down here for nearly two centuries now, although the tea of the early 1800s doesn’t much resemble what most of us drink with cornbread and greens. Back then, the tea was green tea, and it was served as an ingredient in punch — spiked with champagne or rum, and sweetened with sugar and cream. 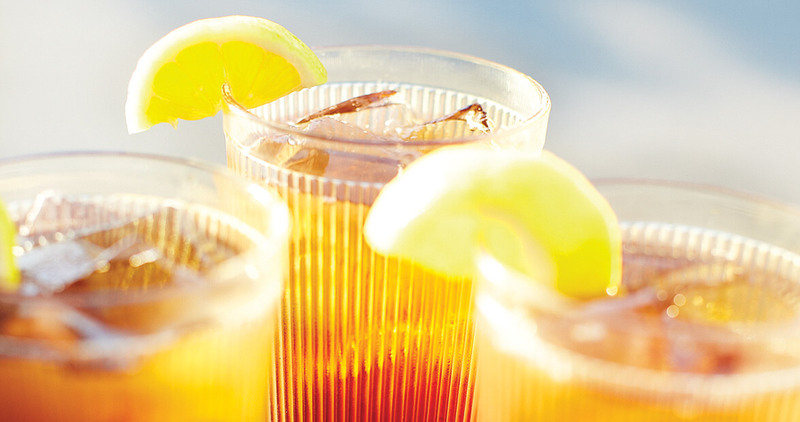 Cookbooks had recipes for basic sweet tea, but people still drank it mostly in punches. The two big events that converted the South to the sweet tea we know today were Prohibition, which got rid of (most of) the nation’s alcohol, and ice delivery, which gave people a way to cool down a big glass. By the 1930s, sweet iced tea was as common at the Carolina table as salt and pepper shakers. You can buy sweet tea all over the country now, way past the sweet-tea line. McDonald’s sells it nationwide. Just about any convenience store sells a bottled or canned version; you can even find it in vending machines. But if you’re in North Carolina, and you buy sweet tea in a can … well, bless your heart. Maybe you could just hide it in a paper bag. What we’re talking about, when we talk about sweet tea, is something brewed that morning, stirred by hand, served by a waitress who calls you darlin’, poured out of one of those special pitchers with the spout on the side, or better yet, sitting in the fridge at your mama’s house. Even within the simple sweet-tea trinity — tea bags, sugar, water — there are all kinds of variations. Some people steep the tea for half an hour, some let it sit all day. Some people throw in a couple extra bags to boost the astringency — the thing that makes your mouth a little dry, like a glass of red wine. And then there’s the sugar. “I know some places you feel like you better have a good dentist before you drink the tea,” Gilbert says. That’s true — every so often, you’ll take a swig of tea that would be better off poured over pancakes. But this is part of what makes sweet tea so intoxicating. It’s homemade, if by “home” you mean all those little Formica diners and smoke-smudged barbecue joints scattered across North Carolina like pepper flakes. One day, the tea guy’s not paying attention and dumps in too much sugar. Or your sister’s making it at home and ends up one bag short. Or you’re off up North somewhere, trying to turn Lipton’s finest and tap water from a glacier lake into something that reminds you of a summer night in Wilkesboro. Sweet tea is homemade. And it’s part of how you make your home. Andy and Tina Gregory, the folks at Pressley Park, put a lot of work into their sweet tea. They arrived in Charlotte 30-some years ago from Greece, after a brief stop in Boston. When they opened their first restaurant, the House of Pizza, they didn’t know how to make sweet tea. But every day they brewed a pot, and every day they asked their customers how it could be better. After a few weeks, nobody complained anymore. They say they haven’t changed the formula since — and that goes for the secret ingredient, too. It’s great sweet tea. But the truth is, it tastes a little different every day — depending on how hot the water is, and how many strokes Anita Hall takes when she stirs the sugar in, and what time of day you order it. There’s no magic formula, because sweet tea is about people. That’s the magic part.